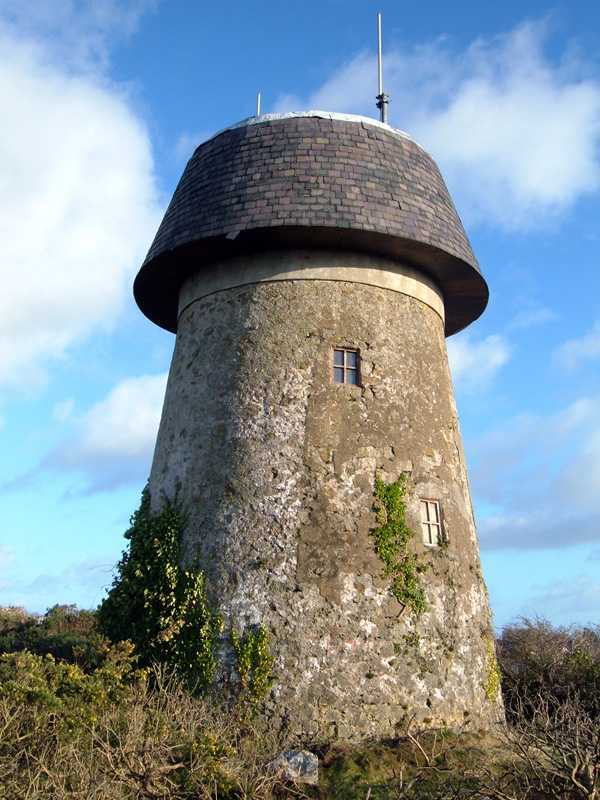 Llangefni Windmill - known as Melin Wynt Y Graig on the Isle of Anglesey (Ynys Môn) in North Wales. Llangefni, Melin Wynt Y Craig Windmill in 2005. I believe that the windmill known as Melin Wynt Y Graig Windmill in Llangefni was built around the year 1828, and continued working until the early 1890's. In the year 1881 the Corn Miller is recorded as being William Williams, aged 42, and originally from Cerrigceinwen. He lives at the mill with his wife, 2 sons, 2 daughters, mother-in-law, and a servant. In the 1881 census for the parish of Llangefni, there are the usual amount of professions associated with corn milling e.g. Carriers and Flour Dealers, but with there being no less that five Corn Millers (1 retired) living in the Town, it is true to say that is an unusually high number - certainly for any parish on Anglesey. In the early 21st century the windmill was repaired and converted to be a mobile phone mast. The mill is visible from the whole of Llangefni.